Are you unable to continue working due to a disability? Was your disability claim denied by Social Security or an insurance company? Were you injured and now can't work because of your disabling injury? You must proceed carefully when applying for benefits and compensation — Social Security Disability, Long-Term Disability, Disabling Personal Injury! One mistake in a doctor’s record or a missing form can make the difference between benefits or months, possibly years of delay. You will encounter a bureaucratic monstrosity from a government benefits program having its own hurdles to jump to greedy insurance companies out to inflate their profits by denying or minimizing your claim. Having a lawyer gives you a big advantage. Having a lawyer knowledgeable of both disability claims and injury issues is invaluable. Our team at Louisiana Disability Law is your partner to guide you through this process. You wanted to get back to work as quickly as possible after your illness or injury. But as the weeks went by, that hope drifted further and further away, and now your doctor has said that you may not ever be able to perform your old job again. You may not be able to walk, sleep through the night, or get through the day without severe pain! Your application for Social Security disability is DENIED. You paid for your Social Security benefits with every paycheck, and now can’t get them when you need them! Your long-term disability insurance that you paid for with your hard work tells you that you can work, so you are being DENIED! A greedy insurance company is fighting you tooth and nail to DELAY or DENY payment for your injuries even though you were not at fault and still CANNOT WORK! You’re frustrated by the system and scared of the future, and you don’t know where to turn. You trusted that your employer would take care of you, and you were disappointed. The long-term disability benefits you earned through your work were denied unjustly! Above all, you can’t believe you’re expected to deal with a mountain of paperwork while you’re struggling just to make it through the day. Let us help you. 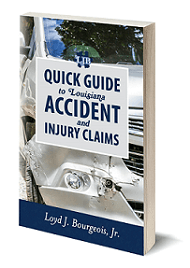 I am Loyd Bourgeois, a Louisiana disability attorney in Luling, Louisiana. Our team hears stories every day about good, hard-working people - just like you -who can barely make ends meet because they can’t work anymore. SSA has denied their claim. The long-term disability insurance company has cut them off from their earned benefits. Or they haven't been able to work since being seriously injured in that auto crash and the insurance company refuses to treat them fairly! Many have been denied their rightful benefits and compensation, and some are about to lose their homes because they can no longer pay the mortgage or rent. Call our team today, so we can start investigating your claim and strategize how to best argue for your disability benefits or injury compensation! We can come to you if your disability or injury prevents you from coming into our Luling, St. Charles Parish, Louisiana law office. Sick & Injured Louisiana May Qualify for Social Security Disability Benefits, ERISA Long-term Disability Benefits and Disabling Injury Compensation! Are you struggling to put food on the table, pay for your medical costs, or pay your household bills because of a disabling injury or illness? You need to replace the lost income you have because of your disabling injury or illness. You may be eligible for Social Security Disability Insurance based on your work history. Perhaps you had a long-term disability policy through your work that can provide benefits. Or maybe you suffered a disabling injury due to someone else’s negligence and you can make a claim against their insurer. All of these programs have rigorous application and claims processes that rely on complicated paperwork, medical records submissions and reviews, phone calls, and income calculations—all of which are confusing in the best of times, but nearly impossible if you are coping with a disability or disabling injury. Our team understands the significant financial hardships that disability imposes on an injured worker. You will face difficult and specific challenges. We know firsthand how the onset of a medical disability or a disabling injury can affect you physically, mentally, and socially. You are operating at much less than your best when you apply for benefits or are forced to deal with a greedy insurance company. The questions take longer to understand, phone interviews confuse you because they talk in circles, you just want to sleep or rest or lay down…and to add insult to injury, you get the feeling that no one believes you! You no longer have to be overwhelmed by your disability case or your injury claim. Let your team at Louisiana Disability Law take the anxiety and stress out of the disability application/appeal process or disabling injury claim process. We have developed and refined tools and strategies over the years to give you the best chance to win the benefits you worked for and the compensation you deserve. Access. Some lawyers never meet their clients until the morning of the disability hearing. When Louisiana Disability Law takes your case, you will speak to your attorney at the beginning, middle, and end of the process, including a pre-hearing, in-person meeting (in most cases). Try getting that with the big national or local disability representatives who advertise on television! Answers and counsel. Our clients know they are more than just a case. The Louisiana Disability Law team goes beyond the paperwork and legal issues to get to the heart of your concerns. We love getting to know each of our clients on a personal level, and we understand that your current situation does not define you! If necessary, we are happy to meet with clients in their own homes. Knowledge. Your Louisiana Disability Law team has extensive legal experience and have worked with many medical impairments and injuries. This knowledge and experience result in us being able to anticipate common objections in your case, gives us a unique understanding of what the other side will be looking for in order to dispute your claim, and helps us formulate the most effective strategies for success. From our St. Charles Parish - Luling office, Louisiana Disability Law helps a wide variety of injured workers across Louisiana get the disability payments and injury compensation they deserve! For most disability and disabling injury cases - No Fees or Costs unless we win! Call the number on this page or fill out our online contact form to schedule your free, confidential consultation. Make sure that the medical records diagnosing your condition are included. This may be an MRI, CT Scan, EEG, EKG, stress test, nuclear test, or other appropriate testing. It is important that you "know your medical records." Make sure your medical records document ALL of your symptoms and limitations and the residual effects you experience. Your medical records should not just document your stroke, they should include your physical therapy, speech therapy or other therapy you have undergone. You need to let your doctor how often you feel symptoms, how severe each symptom is and how long each symptom lasts. Make sure that all your medical problems are adequately documented by your doctor, and that you are receiving the appropriate medical attention for all of your disabling symptoms. Make sure any side effects of medication are noted in your records. Have someone assist you with your claim if your memory, concentration, etc. prevent you from completing the forms yourself. See a specialist. Treatment of stroke and recovery by a neurologist will carry more weight than the same diagnosis from a family physician or internist professional. Comply with your doctor's orders and try what is recommended. See a mental health professional. If you are suffering from depression or anxiety as a result of the chronic problems and inability to participate in life, see a mental health professional to diagnose, treat, and document these conditions. See your doctor regularly and keep your appointments. If you can, provide evidence of a long work history. Provide examples of unsuccessful attempts to return to work and/or unsuccessful attempts to work in a decreased capacity, if applicable. Include information from non-medical sources to support your medical claims. Gather Information from neighbors, friends, relatives, clergy, and/or past employers about your impairments and how they affect your function. Have them document changes that they have seen in your ability over time. These are not given nearly as much weight as testimony from a medical professional, but they don't hurt. Keep a journal. Make regular notes about your impairment, level of function, and treatments. If you need assistance with your claim, contact an attorney who specializes in Social Security Disability. 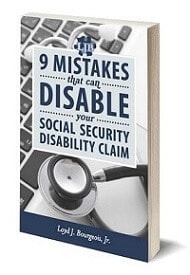 Disability attorney Loyd Bourgeois has written a helpful book, "9 Mistakes That Can Disable Your Social Security Disability Claim"